This year marks my 8th TEDActive conference. 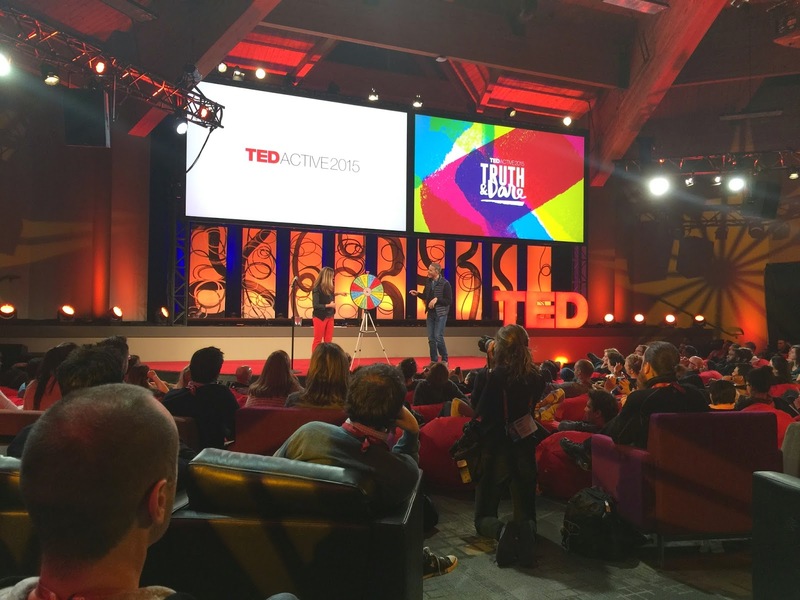 It turns out that very few other people have been at all of the TEDActive conferences—I was one of only a handful of people left standing as the host Kelly had returning attendees stand and then sit as she increased the number of previous conferences people had attended. I come here every year primarily to have the TED talks force me to think. And, not just think, but to make me question and test my thinking in new ways. I do my best to attend all of the talks and even try to speak to some of the many interesting attendees. Mark and I arrived late Sunday night (12:30am local time) after a long day of travel. I was even more tired than usual as I had only arrived in Raleigh on Thursday evening from Susie’s and my trip to Spain and Morocco. Fortunately, the first day of TEDActive did not really get started until the afternoon. 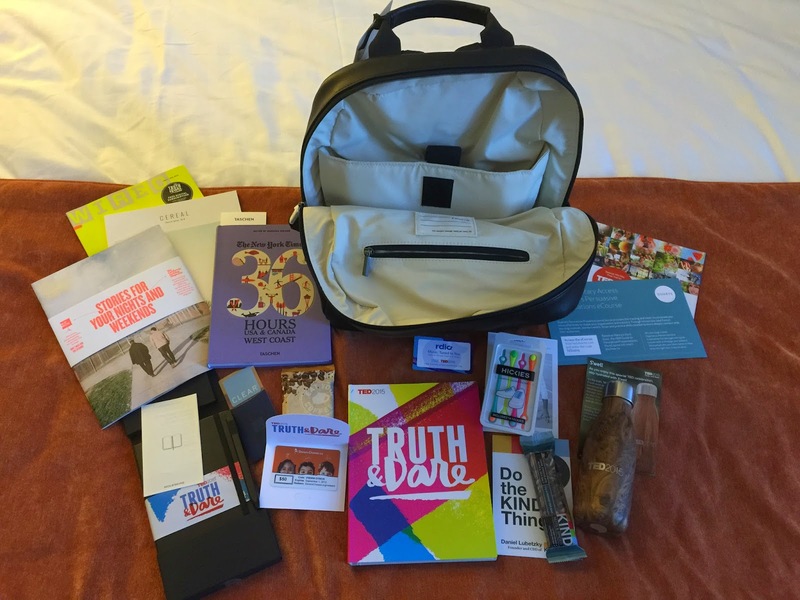 Before the sessions began I registered and got to see what was in my goody bag. The bag itself was a nice one from Moleskine, but nothing in the bag itself was particularly exciting. I’ll try out the odd Hickies alternative laces for sneakers and maybe some of the Websites like Donors Choose. I miss the gadgets from previous years, but at least this year’s items will not be too hard to transport home. The first pair of sessions were short talks from TED Fellows. Many of them were interesting and engaging, but none really grabbed me. The TED Fellows presenting were from all over the world. The one that stood out to me was eL Seed, a graffiti artist who uses ornate and beautiful Arabic script in his work. He started in Morocco and I could see the relationship between his art and the intricate Arabic script woven into the architecture of many of the old buildings I recently saw while there. The first and only real session of the day had a set of very good talks, though none earned my first standing ovation of the conference. Kevin Rudd, the former Australian Prime Minister, spoke about the future of geopolitics in light of the rise of China. Foreign policy strategist David Rothkopf looked at the political challenges facing America (and the rest of the world) due to political inaction and the conflict between politics and science/technology. There were cool future tech demos of very fast 3D printing (a couple orders of magnitude faster than my printer) and the ability of sophisticated software to reproduce sound from video of objects (like a bag of chips) that vibrate due to sound waves. The band Moon Hooch made me want to hear more of their odd combination of jazz and dance music. Finally, the performance artist Marina Abramovic gave an quirky, but ultimately thought provoking talk. I've never really been a fan of performance art and hers seemed similar to others I had read about. Her personal telling of these performance pieces did make me think more about the role of performance art. She finished by having each of us find someone we did not know and stare into their eyes for two minutes. It was uncomfortable, but I am still thinking about the exercise hours later. 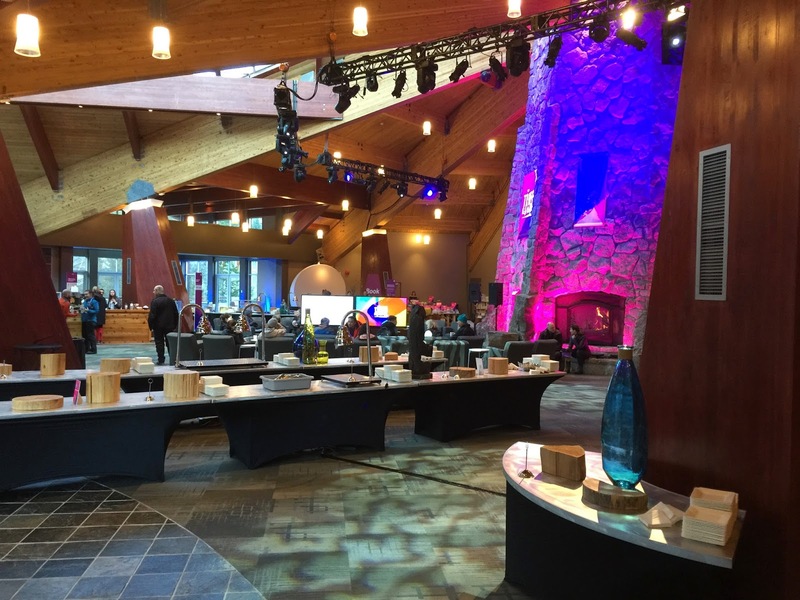 At the evening party, I spoke with some interesting folks while foraging over odd food. Suffice to say, despite hearing from some folks that poutine is amazing, I thought it was horrible and could not get the taste out of my mouth! Regardless, it was a good start to TEDActive 2015 and I look forward to the next several days.